Before the invention of the car, jaywalking wasn't a recognized concept. Want to get across the street? Then just walk across the street—nobody's going to stop you. But the rise of the automobile posed a new problem for people of the early 20th century. While the median state-designated speed limit for American cities was just 10 miles per hour in 1906, the pace of American streets soon increased enough that people who wanted to cross them were suddenly putting themselves in harm's way. So cities across the U.S. started to regulate where and when pedestrians could cross. You can see the faint pedestrian crosswalk lines painted on the street in the scene below from Detroit circa 1917. Despite the clear mortal danger, these regulations were pretty broadly ignored until motorists and police started using an even more powerful force than law: ridicule. In his 2007 paper, "Street Rivals: Jaywalking and the Invention of the Motor Age Street," Peter D. Norton describes how ridicule was recognized early on as the best socializing force to control pedestrian behavior—behavior that would have to change with the times. Laws might help regulate pedestrians, but when there are too few police officers and too many citizens, there needs to be a radical shift in public attitude if a given law is deemed too radical for its time. For instance, a law that would restrict how a person could do something as basic as crossing the street. As Norton explains, "before the city street could be physically reconstructed to accommodate motor vehicles, it had first to be socially reconstructed as a modern thoroughfare." And that social reconstruction meant redefining who belonged on the street, by poking fun at those who were seen as unwanted. This ridicule would show up in newspaper editorials, in verbal confrontations between motorists and pedestrians on the street, in American classrooms, and through public shaming by police officers and other authority figures. The word jaywalker wouldn't appear in an American dictionary until 1924, but its earliest use dates back to the 1900s. Jaywalker comes from the derogatory term "jay," which in the early 20th century referred to an idiot or rube from a rural community who would be out of place in the city. "By extension," Norton writes, "a jaywalker was someone who did not know how to walk in the city." People who didn't cross the street according to some newly established norms were thus supposed to be treated as backward country bumpkins who didn't understand how a modern city worked. 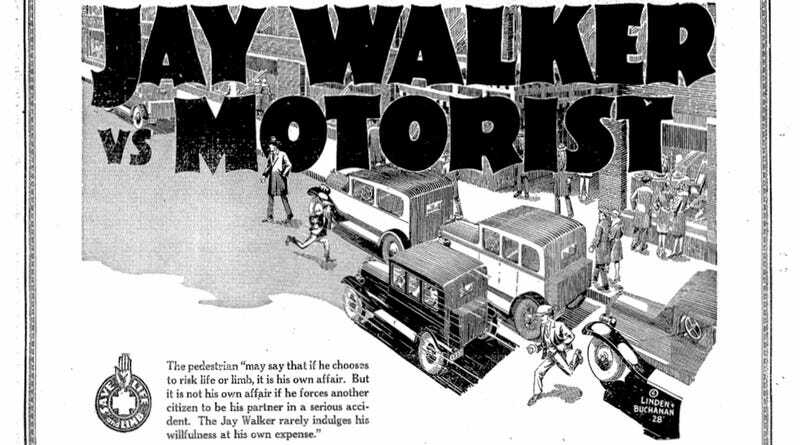 The automobile was ushering in the future, and the jaywalker was its greatest threat. In a 1920 safety campaign in San Francisco, pedestrians found themselves pulled into mocked-up outdoor courtrooms where crowds of onlookers watched as they were lectured on the perils of jaywalking. The idea was to "kid the people into taking care of themselves," through surely many defendants didn't appreciate the joke. According to Norton, the Boy Scouts were also instrumental in publicly shaming jaywalkers throughout the U.S.
During a 1921 safety week in Grand Rapids, Michigan, for example, the safety council posted Boy Scouts to issue cards to offenders, teaching them that they were jay-walking." To justify the curtailment of pedestrians' customary rights, the cards explained that cutting corners was permissible when traffic was horse-drawn," but "today it is dangerous — conditions have changed!" As a local newspaper put it, "thousands of people who never knew what jaywalking meant have learned the meaning of the word." In 1925, 1,300 Detroit school children gathered to witness the public trial of a twelve-year-old accused of "jay walking"; the student jury convicted the defendant, sentencing him to wash school blackboards for a week. Another person who saw the potential of ridicule as a force to keep pedestrians in check was a man named E. B. Lefferts. He worked for the Automobile Club of Southern California and helped municipalities all around the country understand that laws alone wouldn't keep pedestrians off the road. Speaking at a 1927 convention in Chicago, Lefferts explained, "We have recognized that in controlling traffic we must take into consideration the study of human psychology, rather than approach it solely as an engineering problem." Writing in that same year, Lefferts elaborated that "the ridicule of their fellow citizens is far more effective than any other means which might be adopted." Lefferts had learned valuable lessons in Los Angeles, where ridicule was being used in conjunction with new jaywalking laws in the 1920s to make sure that the public got the message. L.A. police would blow whistles at jaywalkers, and though some people would protest loudly (and sometimes even violently) most pedestrians were shamed into submission. After hearing the policeman's shrill whistle the vast majority of people, "grinned sheepishly and scuttled back to the curb." The 1920s would see countless visions of the future which included separating automobile traffic from pedestrian traffic. Futurists like Hugo Gernsback wrote about the cities of tomorrow which would often include three levels — the below ground level for cars and trucks, the ground level for pedestrians, and the roof level where airships would sail through the sky. Should one of the pedestrian pests chance to step into the path of an approaching automobile; should the automobile strike him, and should the automobile suffer damages, the jay walker is held liable. Motorists who were upset that they were taking the blame for auto-on-person accidents coined the term jaywalker to ridicule pedestrians. But pedestrians countered with terms like "joy rider, "jay driver" and even "flivverboob." As we know from history, they didn't quite catch on. The establishment of the jaywalker as the rule-breaker was a decades -long effort to keep pedestrians on the sidewalk. And it worked. A week ago, protestors who were angered by the verdict in the trial of George Zimmerman walked out on the 10 freeway. It was a rather jarring sight — people simply walking on a major highway in the second largest city in the country. But to understand why this scene was shocking, we have to go back a century and explore the battle between the automobile and pedestrian on American roads. We've been socialized to understand that certain places are not for pedestrians—and with cars today zipping by at 70 miles and hour, it's become pure common sense.